Pooh Said "Do you think the bees SUSPECT something?" First of all, as of yet, Hope is off somewhere. She has had kittens sometime within the last couple weeks, but we don't know if they are still alive or not. She is pretty young. I have a couple of leads on a home for her, and I am Hoping all works out for the best. Did some Bees today! Mads, the Boss and I. We had to go and check the new hives to see if they needed more sugar bucket, which they get to kind of start off until they can get up enough strength to go out and really gather. We also checked to see if the Queens, all four of them, were doing their thing. You know, eggs, and all. Yup. LOTS of flying in and out, activity, bees, buzzing. Everyone doing their own bee thing perfectly. The Yellow Hive is Hannah. She seems to be building kind of all off to one side. Like the others, she hasn't filled up enough frames with brood and comb to add another brood box. The Green Hive is Wendy. Here, as you can easily tell, are The Mads and The Boss adding a new feeder bucket. An exacting process that Miss Mads trained for all last year, before finally being allowed, under close supervision, to finally attempt Adding The Feeder Bucket, all on her own. Of course, as you would expect, she did brilliantly. When I spoke with Mads afterwards, she was, as expected, exhausted, but clearly proud and happy, she had this to say " It was exhilarating! The time of my life!!!!!!!!" before walking, all on her own, back to the house where she collapsed, fully bee-suited, on the trampoline. I thought that since last night was such a very sad rescue kitty story, we might remind ourselves that we DO save them too, and some stories are happy ones. For those of you who remember the Jungle Loves 1&2 who came to me a little over a year ago, here is a recent picture of them, very happy, and you would not ever know them for the two sad, un-social, abused little Bengal waifs that they were when they came to me. They are in their Home, with their own people now, and it's this that makes my heart happy. And this that makes a difference. I hope Hope brings her babies to you, if they're in need of help. Poor thing! The Jungle Loves look so happy with their People! Bees and Jungle loves. :) Very nice! Looks like a good day. Spooky daughters mind is blown! You rock! Hurrah for jungle loves 1&2! What a magical day. I love seeing all of the colorful hives. And JL1&2 look so happy. It does a heart good. hooray bees! those pics are marvelous:) he first one of maddy is just amazing. i'm glad you got to do something uplifting, you deserved it. i think hope is well named. Tend hives in the spring sunshine. And Magic just ate chicken from my hand.. I hope this lovely day helps make up for some of the recent crap ones. Had my own lovely day w/ ben. He got his haircut, we went to the beach w/ a few of his friends (and moms), then he had swim lessons. We read books, he helped me peel fava beans...great day. I just booked our rental car for Fiendom come! Forgot i hadn't done that before. Have to have it w/ the car seat issue, etc. it's coming up so quickly! Hooray for Magic eating from your hand! Hi new Fiends! Sorry, I'm not up to my usual maniacal welcome. I hope you understand. Love the picture of the Littlest Beekeeper! The happy Jungle Loves photo is heart warming. Off to encourage my head to stop hurting. Oh happy post..smiling Mads, bees, happy Jungle Loves and their human and Magic eating off our wonderful leader's hand. This has done my soul some good. I hope your head complies, Lexocat! Sally, how is the new diet going? Ariandalen, plenty of time for maniacal greetings. Things are a bit nuts-o all over it seems. SO much going on. And welcome to all of those who have come aboard lately. OK. I really need to go to bed!! Night and morning to all. Yay for bees behaving and working and doing their bee-things! The jungle loves look so relaxed at at home. :) You do such good work Quiche. Even Magic is now eating out of your hand. Lexo, may you wake up headache free. Hmmm. Some days feel like a tilt-a-whirl. Yay for the good days, those days when the ride pauses and a body might relax a fraction. Yay for days with bees and mending bengal hearts, fiends, beaches, good food, enough food, Hope, employment, a modicum of enjoyment, new homes, music, Spring. Sleep. The diet is a lot easier than I thought. The hardest bit will be if I am out - a problem all people with food allergies and intolerances,but hey that means I won't be eating cakes and biscuits, and addiction that has seen me put on far too much weight in the last year! And Lexa, here's hoping for a better-feeling noggin tomorrow! 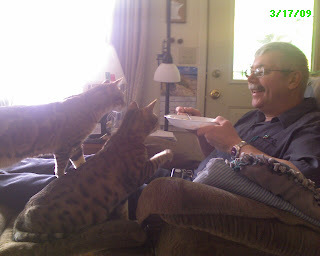 And I can see that, in line with Bengals tradition, they are VERY interested in their human's food. It was such a sad day for kitties yesterday. It does good to see a couple of happy ones. Did Magic get his cuddles? That is an awful lot of bees and yet more to come!?! My eyes are refusing to stay open. I bid you all good night. Happy Bee & Bengal Post :-) I love that picture of Maddy - is this the same gravestone that Boss wanted a Zombie hand for? Magic eating from your hand, and letting you pet him is awesome. Merry, I hope that you are able to get that kitty to the vet. It sounds liek the kind of situation where a call to the SPCA might be in order. Let us know how it turns out. Here's hoping that Hope and her kittens return. I can't believe it's been seven years since that Maddy-in-the-leaves picture. Time flies. So glad you had a lovely day, full of bees and Magic. I seem to remember that the hobo sign for a kind and generous house was a cat. Clearly your sign shines brightly. Hi Meg, glad you found your way here, people who do generally belong. And I love the way people are assuming there AREN't pictures of Maddy on the trampoline. Q, that's only because if any of us had pics of the Amazing Miss Maddy, we would be unable to resist the need to post them right now. You, obviously, are a much stronger woman. But then, we knew that. Ok, who is running this party? And what the heck is happening? And do I really want to know????? Other than the coronation, I have no idea. 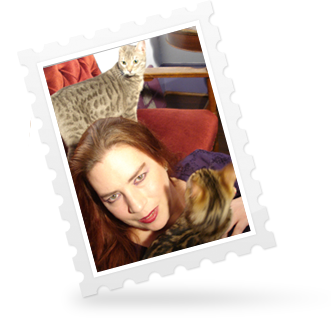 Lorraine, when it comes to cats, you obviously have the magic touch! I'm not sure anyone's running it. It sounds like we're all just turning up. Then mayhem will ensue, probably. Hope Hope and kittens are okay. Glad you are happier! And hurrahs for Magic letting you pet him, and eating from your hand! Good stuff. So I had an Adventure with an electrician this morning. Bad main breaker! Unexpected lack of power for like twenty minutes. All is fixed, but sheesh, he was only here to move an outlet for me. Now I am 300 buckbills poorer. and failed the thread. Poo. Hannah Montana or Hannah Atchison??? ps Jess: buckbills...can i use that!? love it! Kitty, Hannah Atchison the tattoo artist? has anyone warned the authorities about the fiend gathering? is your sleepy town ready for fiendish happenings? Wheee i am so excited! i shall be there sans boy who forgot to request time off and someone else is taking an extended leave during that time now. Kitty, it's all yours. I do not doubt that you shall employ it with elegance and aplomb! Yay! Happy (food obsessed) Bengal beauties! Do you folks ever put actual bets on hives? And here's hoping we hear more good news on Hope and kittens soon. I have actual Plans tomorrow. Fun Plans. Amazing, isn't it? Every year the Chicago Architectural Foundation has a day of free tours all over the city. In the morning, I’m going on a river boat tour of downtown architecture. Then in the afternoon a walking tour of Devon, a street in north Chicago which has many little South Asian groceries, restaurants, and sari shops. In between, I’ll be able to go to my favorite knit shop and pick up the second issue of Handknit Heroes (a new comic for fiber folk; yes really). It’s feast or famine with the excitement here. Time to feast! Anyone else with Fun Plans? oss i am so jealous. I wanted to go on the boat tour when i was in chitown, but it was expensive. there was a lovely old library that was some sort of historical society headquearters we went in that was magnifigant. they had an exhibit of nick cave suits that was totally weird and a delightful surprise. also something about transportation inthe city. Jess, it's ok, boys are allowed. mine was silly and didn't request his tie like i told him too. he really wanted to go. it all works out, now we have a vacation away form each other. OSS your plans sound great.I have a big heap of new books, and they are forecasting rain, so I'm thinking a weekend full of books. And maybe some baking. Yay for happy bees, Maddy, Jungle Loves, a happy post! OSS -- Love Chicago architecture! Have you been inside the Rookery? Oh fiends! Check it out! Hamsters and Shakespeare! I have torn up the pizza flyer I found in my mailbox. Whew, that was a close one! Both my boys are coming to the party! Boss bought me a present for just because I rock! And a card! The funny thing was, it was in the framers where we get the art done, the only thing in the place,I would want in my house and I can't tell if it is hideous or wonderful. He saw it the other day and said the same thing, and the lady told him I loved it.....SO he got it for me. Now I have to re-arrange the dinning room to accommodate it. Are you absolutely sure you want to do any more rearranging, Ms. Fabulous? Is it absolutely necessary? Did Mim ever pee in the special litter? Ohhh, presents! Most excellent way to go. Those Hamsters are so cute AM, I think I'd like one, but imagine that the furries here would think I was bringing home a snack for them. Your boss rocks...and you rock...and presents and cards rock. Lets all rock out together. Trying to come up with arbitrary ad price to quote someone who wants to advertise on foodporn. I've only ever done banner contracts, not editorial ads...dont want to lowball myself! Or, maybe, I should say we will remake the world in our image in six weeks and counting? lol more rearrainging. i now have this vision of your home in continuous flux, no room is every the same when you enter it. the lay out of hte home stays the same, the contents move around to suit your mood. What a nice thing your Boss did, Q! It is good when people notice ones Rock-ness. And You my friendly fiend work so hard. I am so glad to know that this is noticed. Rock on. Fiends will rock the Still Waters for sure. AletaMay has a list. We are organizing ourselves, hither and yon. We shall meet, and we shall do things. We shall talk and laugh and eat and sing and sleep and do whatever we bloody well please. I got an endorsement for Stillwater as a lovely town, but we are to avoid the winery. Vinegery tasting wine, and you have to pay to sample. It's off my list. Vampi, got it in one. HOW re-doing Magic's room (tricky as he can't KNOW I've done anything) can lead to cleaning out the closet in the butlers pantry I will never know. And mind you this darn project STARTED as I need to hang my hideous mirror. In the dinning room. Sally, are people in your-neck-of-the-woods sensitive to allergies and what-not? Sometimes if you have a favorite place or two you can let them know what you need and they can accommodate. I am glad that the diet is not as hard as one might think. Continued good luck! Hi Gaypet. Some are, its more at this stage me keeping in mind what I can and can't have...and with things already made (like biscuits) places won't necessarily know what is in them. I left work slightly early (5:30), and now on my second beer (and I'm a ridiculous lightweight, so that's a lot), and have the dog and the laptop, but the cat is in the enclosed courtyard eating grass. I should join him, actually, as today is just lovely out, and tomorrow will be much less pleasant. Mistress, I know I am insane for spending Friday re-arranging the Spooky House, but joining your cat n the courtyard to eat grass is just plain weird. Magic's room is done. He WANTED window treatments and Underworld posters. He told me so. Yay for May and bees. April showers bring May flowers and May flowers bring bees. Right? Or May on its own brings bees. Either way, bees are good things. I had a dream last night that I went to MN and made an idiot of myself. Allow me pre-apologize just in case this actually happens. You little spring cleaner you... Just hold your horses (horses, hee, I think of you and your horse and smile) All your dreams (for spooky house) are soon to come true, my pony riding, kitty saving, fabulous you!!! No, Emily, I will not allow you to pre-apologize for something that hasn't happened. We've had so much more time to practice. But really, what is the point of having a courtyard if you don't go and sit in it? I'm with Quiche, Mistress. I was convinced you were going to eat grass with your kitty. How accepting am I that my only thought was "Oh, she must have an upset tummy, too."? I can't imagine that anyone is going to embarrass themselves enough to need any form of apology. We're a very tolerant and accepting bunch. We may, however, laugh at you. I imagine I will get lots and lots of laughing. I can be such a tard... And I love being a tard. Hee-hee! I study grass professionally, but I try to not consume my work! But WHERE did the 3/4 of a blog post I wrote at lunch disappear to, I ask you? If it isn't posted tonight, I have to start over from scratch. And apparently I will. I have enough energy to finish it tonight, if I knew where it was, but not enough to rewrite it. Blast! Well, Ariandalen, at least Fiends are accepting of mistakes. A good - a wonderful - group of friends. Fiends. Whatever. Good-night, Fiends. Must rise and shine for Will's baseball game tomorrow; it shall be a busy weekend. I have herbs! I forgot to add that to my list of excitement. A friend picked them up for me at a garden fair this morning. They now have nice pots and are on a cart in front of my kitchen window, which is large and faces south. I hope I don't kill them, like all the others before them. This is the first apartment I've lived in where indoor herbs seemed possible. I have basil, thyme, cilantro, Italian parsley, and rosemary. Mmmmm, herbs. Right, read a little more, then to bed. Busy weekend here...saw DD play (Moss Hart's Once In A Lifetime, about the advent of talking pictures, silly and fun) for the 2nd time tonight, but will miss tomorrow as we are headed to MD for an overnight with good friends we rarely see, and then to a wedding in WV on Sunday. Fun for sure! I'll have lots to catch up on Monday. Hooray for surprise gifts of wonderfully hideous (or hideously wonderful) art! Please to show us pictures when it's up. Now: bed. Night! Have a good Friday eve, all. Oh Jess... to be 35 again. I almost am able to remember that long ago. I'm yearning for 26, myself. :D Hey you kids, get off my lawn etc. Oh Jess, The 40 year old crisis is not all it's cracked up to be. Sure, you discover youself, but the rocks you need to look under are VERY heavy. So, that makes 60 the new 50....Does that mean I still won't be a crone by my next birthday? Sigh. Maybe some day I'll achieve wisdom. I've got the wrinkles...earned every one! I'm not one to dread bdays. My gma just turned 89 and still volunteers at the police dept. front desk every day. She's not old! Off is the new On. Out is the new In. And many other things i've grabbed from AFP's tweets tonight. House is more of less there and the new post is UP! Hurrah for a wild Friday night! That last picture made me cry after just reading about Hope. It's just like the story of the starfish on the beach. You made a difference to that one.